Figuring out whether your child is getting enough sleep during a 24-hour period can be stressful. Every child is different and if my kid sleeps less than someone else’s kid I feel panicky, worrying about their mental and physical development. There is no exact formula for sleep patterns, but there are some guidelines used to determine what is considered “normal” for each stage and age. Newborns and Infants need the most amount of sleep, obviously. For the first few weeks they sleep pretty consistently throughout the day. Newborns should be taking 3-5 naps a day and 8-9 hours of night time sleep, 16-18 hours a day. Naps will be several hours long and then the baby will be awake generally 20-40 mins between naps. Two to four month olds should be taking 3-4 naps a day and having 9-10 hours of night time sleep. This totals 14-16 of sleeping hours per 24 hours. Four to six month old babies will generally go through a leap here and be awake a lot more during the day and hopefully transitioning into much longer stretches at night, some even able to go all through the night without waking. Babies will nap 2-3 times a day and can sleep 10 hours at night. 15 hours is recommended for 4-12 month old babies but its more common to get about 12 hours out of them a day. Six to nine months of age will probably be in their sleeping routine now, no more day and night confusion and in a more predictable sleep pattern throughout the day, 2-3 naps with a solid night time routine. Six to nine month babies can sleep for 14 hours in a 24 hour period. Right around this time I know my kids did another transition to two expected naps a day and then would sleep 12 hours at night. Their diet will also change around this time to more table food. Some moms have found this transition to table food to be helpful for their night time sleep because they seemed to be more satisfied at night. You may notice around this age your little one will start fighting one of their naps or not being tired when it is nap time, this is when they will transition from two naps to one during the day and sleeping 12 hours at night. 18-24 month olds will be down to napping once a day for a few hours and sleeping roughly 11 hours at night. 2-3 year olds can still nap once a day as long as their night time sleep doesn’t seem to be disrupted by it and sleeping 10-11 hours a night. Children this age will drop their day time sleep. So you might get one nap out of them but day to day it might be unpredictable. 3-5 year olds should be having 10-11 hours of nighttime sleep a day. No naps for these guys and about 11 hours of sleep a night. 1. Make sufficient sleep a priority. It is hard, especially for single and working parents, to get the right amount of sleep for ourselves as parents and too often that can bleed into our children’s lives. Set a good example and take care of your sleep habits just as much your child’s, it will significantly improve your child’s view of the importance of sleep. 2. Refrain from working late into the night or allowing your child to stay up too late to work on school projects at the last minute. When you are educated on the benefits of getting enough sleep you can properly educate your children on why going to bed at a good time is important. 3. Keep to a regular daily routine. When kids are in a daycare they stay on a pretty tight daily schedule of playtime, snack time, meal time, and nap time. When you are at home it is important to stick to a routine as well so your child is comfortable, and will learn to anticipate bedtime and nap times. 4. Stay active during the daytime. It is hard to be ready to go to sleep when you aren’t tired. I know that’s true for me, and toddlers even more so. Plan activities during the day that allow your child to use up that energy so when they head to bed they are tired. 5. Monitor screen time before bed. AAP recommends shutting off all screens 1 hour before bedtime. 6. Keep the bedroom and bed a place for sleep. Keep screens, toys and clutter out of the child’s bed and strongly encourage only sleeping while in bed. One item such as a blankie or security stuffed animal to help with separation anxiety is fine but do not overwhelm your child with too many things to do when they should be sleeping. 7. Stay aware of sleep problems. Sleep apnea, insomnia, restless sleep, fighting sleep, and lack of attentiveness during the day are signs of sleep problems. If your baby is constantly cranky, whiney, needy, clingy, fidgety or hyperactive. If your baby wakes up groggy and falls asleep again quickly after being woken up. If your baby has trouble going from 2 naps to 1 nap. 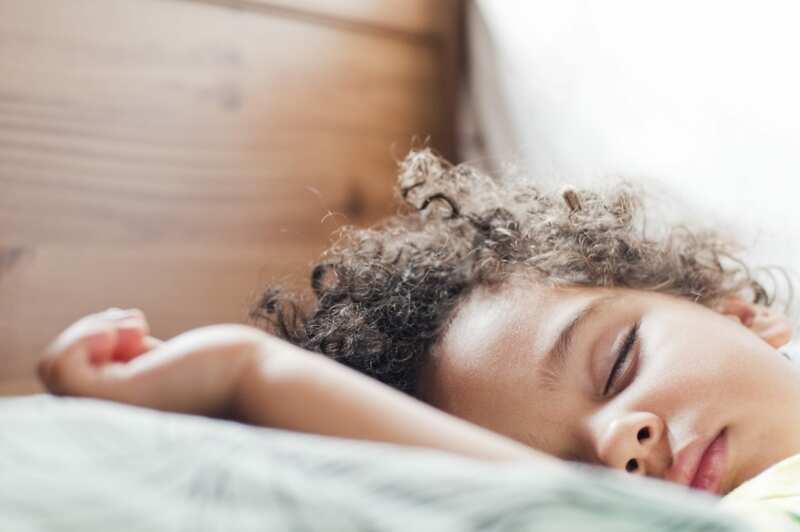 Your little one’s sleep habits may ebb and flow as he grows, and the most important thing to remember is that his little bones and body are growing strong and need plenty of rest and fuel.